The Archdiocese of Baltimore was established a Diocese on November 6, 1789. Baltimore was established an Archdiocese on April 8, 1808. It comprises the City of Baltimore and the following counties of Maryland: Allegany, Anne Arundel, Baltimore, Carroll, Frederick, Garrett, Harford, Howard, and Washington. The Archdiocese of Baltimore comprises over 4,800 square miles and has a Catholic population of 486,607. By a decree of the Sacred Congregation of the Propaganda, July 19, 1858, approved by His Holiness Pius IX, July 25, 1858, “Prerogative of Place” was conferred on the Archdiocese of Baltimore. By the explicit words of said decree of the Holy See, the Archbishop of Baltimore takes precedence over all the Archbishops of the United States (not Cardinals) in councils, gatherings, and meetings of whatever kind of the Hierarchy (in conciliis, coetibus et comitiis quibuscumque) regardless of the seniority of other Archbishops in promotion or ordination. Decree signed by Cardinal Barnabo, August 15, 1858. 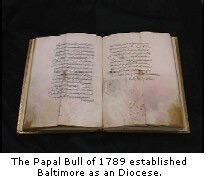 Read information about the Catholic Church in Baltimore from 1789 when John Carroll is appointed the first Bishop of Baltimore through the present.